Built on a hill with beautiful views, this little house was made for entertaining. 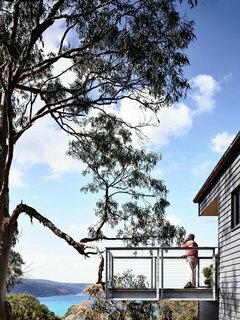 When architect Will Harkness was commissioned to create a house in Lorne, a little beach town in Australia, he met the clients on site with a ladder. "We planted it at various points to assess the views and determine the floor levels." The site is on an incline; to maximize the views, it was built upside-down, with the living spaces on the upper floor and the bedrooms below, accessible on both levels. 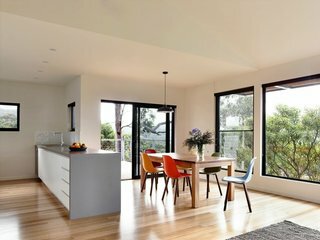 The couple wanted an affordable beach house where they could escape from Melbourne with their grown children during the summers; as teenagers, they’d met in Lorne. The large living area and deck facilitate communal gatherings, and the upstairs study works as a fourth bedroom in a pinch. "The steep site lends itself to the ‘upside down’ configuration," Harkness explains. "It certainly wouldn’t work as well if you could only access the house via the lower level, as this is through the bedroom zone, so we included two entrances. The upper one involves walking across a little bridge." "Keeping the house’s footprint small and focusing on simple, but durable materials kept the overall cost down," Harkness explains. "The owners were delivered a high quality, low maintenance, and functional beach house." 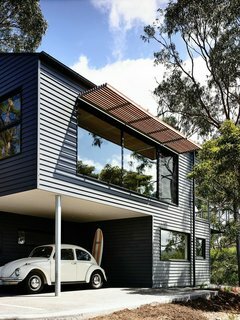 The exterior is lined with fibrous cement sheet, an affordable and hardy material that’s been a hallmark of Australian beach shacks for decades. (This iteration doesn’t have the asbestos that plagued earlier versions.) 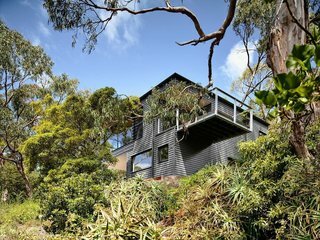 Spotted gum is used for decking, handrails, and shading battens—large gum trees also dot the property. Inside, Tasmanian oak was used on the floorboards, with a veneer version on the cupboards and shelves. 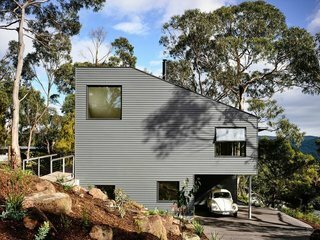 Large gum trees offer a natural barrier for the house. Harkness designed the house's footprint in order to minimize the effect on tree roots. "The retained trees offer a sense of layering and age that new vegetation won’t be able to for a long time," Harkness says. Achieving a light and airy house without letting it get too hot in the summer was tricky. 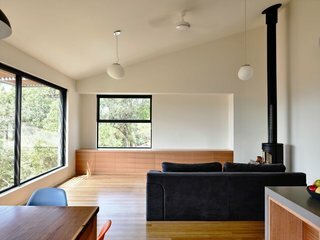 The large north-facing windows are shaded by timber battens and windows were positioned to facilitate cross ventilation. All of the windows are double glazed and the couple went with an eco-friendly cooling system. The cantilevered deck exceeded Harkness’ expectations. "It is incredible to be standing up there with the eucalyptus branches, surrounded by gum trees. It almost feels like a tree house, and then you look down and you can see the bay glistening below you." The homeowners wanted a simple, unfussy space. The walls throughout the home are painted in Dulux Swan White. Built-in cabinets are custom made in Tasmanian oak. The hanging pendants are from About Space and the wood-burning stove is a Morsø 7642 model. The central living area features an open-plan kitchen, living space, and deck with views of Louttit Bay. To maximize energy savings, the house has a ducted reverse air cycle system from Fujitsu. 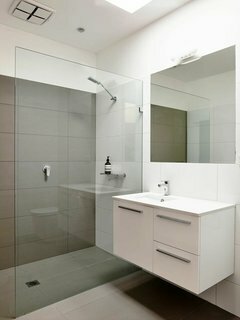 "Keeping the kitchen and bathrooms simple saved money for the important things," Harkness explains. They went with a soothing color palette and hardware from Reece. 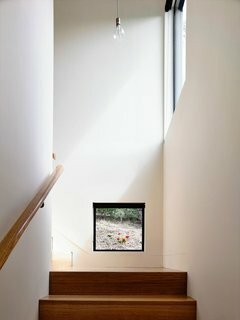 "I love this low-level stair window. It’s at head height when you’re at the bottom of the stairs; it gives you a glimpse of, and connection to, the garden outside. Most of the windows capture what I’d call ‘hero shots,’ but some, like this one, are completely unexpected." The cantilevered deck juts out from the home. "You really feel like you’re floating," Harnkess says.